I used butter cream frosting that I had prepared well in advance. You can make the frosting a few days before, just make sure to whip it before you us it.
. 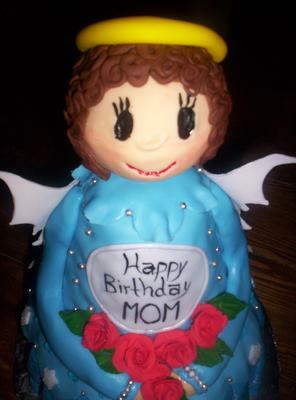 The Fondant may be made up to 2 days ahead. For the cake I used a basic pound cake recipe. You will need to bake 3x 9 round cakes and 1 9" in a metal bowl and 1 in a 6 inch round metal bowl. You must be careful and keep a close eye on the bowls while they are cooking and adjust the temperatures as they will cook differently then the 9" rounds. Once cakes are cooled I trimmed them and cut the rounds in half and frosted them, I also cut and trimmed the bowl shaped ones. I stacked the and chilled them overnight. I trimmed the cake and shaped it into a coned shaped bodice, dirty iced it (to coat with a thin layer of buttercream icing. Then refrigerate again. I then portioned out the fondant and used food coloring. I find that the paste is better then the liquid. 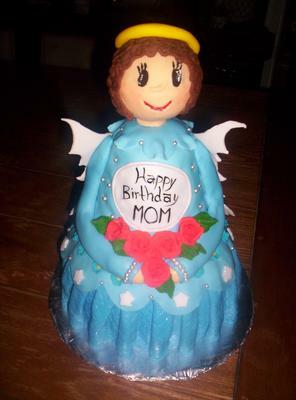 I then made the roses, leaves,wings (used cookie cutter for patterns on the wings) also there is a big red bow in the back, I set them aside until the dress is made. 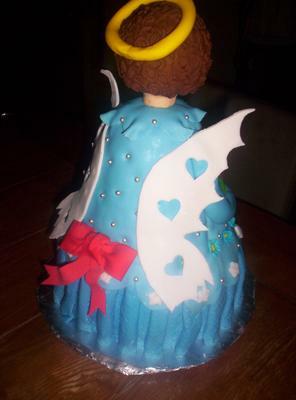 The dress is made of fondant squares with patterns and folded into place. Silver edible balls are used to give it a bit of sparkle. Once the dress is attached then I added the arms and hands, the name plaque and the leaves flower. At this point I attached the wings and the big bow in to back. I attached them using a bit of water that I brushed onto the places were I wanted to attach the items. 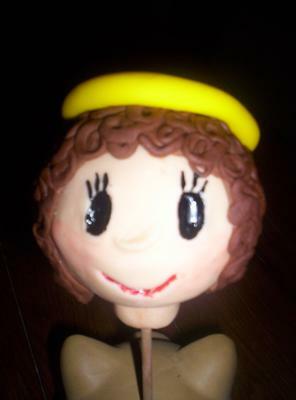 I made the head by putting a skewer threw a styrofoam ball and coating it with skin colored fondant, hand painted the face and added brown curls to the hair. I also added a halo. Then I pushed the skewer threw the top of the cake, being careful not to damage anything.